Maybe I’m just cranky this morning OR MAYBE someone in the corporate office at Safeway needs a swift kick in the *ss and a new job, preferably one that doesn’t involve mango buying & marketing. I went to Safeway this morning to grab some milk, cereal, & juice for breakfast and meandered into the produce aisle. I’d seen crappy mango labeling before at Safeway and have tried to grin and bear it. But no more. Now I’m just ticked off because it seems they are hell bent on deceiving consumers with their mango marketing. I walk over to the mango display. And as it typically goes, Safeway is stocking some of the crappiest mangoes on earth, the Tommy Atkins mangoes. (no, I’m not exaggerating – not even a little) Tommys might, in fact, BE the crappiest mangoes on earth, but I’ll hold off on pronouncing them as such for the moment. In the past, I’ve seen Tommy labeled at Safeway as Red Mangoes. The “red mango” label always irked me, but today Safeway really upped the ante. Today, the potentially crappiest mangoes on earth were labeled “Scarlett mangoes.” ARE YOU KIDDING ME? “Scarlett?? ?” That’s some serious mango Kool-aid, Safeway. The first thing everyone should know is that there is no such thing as a “red mango.” AND there’s no such thing as a “Scarlett mango.” This is just the way that Safeway chooses to label & market crappy mangoes to consumers because the name sounds appealing. I mean, really. “Red” was enough of a violation. Then they went to “Scarlett” ??? It gets worse – and this is how I know they are trying to put some serious BS over on the public and really the reason that I decided to write this post. Guess what was right next to the “Scarlett mangoes”? “Ataulfo mangoes.” Labeled correctly. Labeled accurately. Ataulfo is the actual name of a variety. AND more to the point of this post, Ataulfos are REALLY YUMMY – so OF COURSE, Safeway chooses to label the good variety correctly. Why? Because a fair number of people know about Ataulfos. And the people that don’t know about Ataulfos, but are curious, may go home, check them out on the Internet, learn that they are a good variety, and buy them next time. Either way, Safeway wins. The “Scarlett Mangoes” and “Red Mangoes” are for folks who don’t know any better – mango newbies. Since “Scarlett Mangoes” and “Red Mangoes” aren’t real varieties, the consumer can’t find any real information about them. (convenient eh?) Consumers will pick them up and try them because they are pretty and have a pretty name. But they will be sorely disappointed and may never buy another mango again. Read exactly why here. Until now, no one was blowing the whistle on Red Mangoes or Scarlett Mangoes. Well consider it blown. There is no such thing as a red mango. There is no such thing as a Scarlett mango. Red Mango is a mango euphemism, where the bad label/variety that Safeway is trying to hide is TOMMY ATKINS. Scarlett Mango is a mango euphemism, where the bad label/variety that Safeway is trying to hide is TOMMY ATKINS. Safeway selectively uses the correct labeling on mangoes when it serves them well to do so. Safeway selectively uses incorrect labeling on mangoes when it serves them well to do so. Don’t buy Red Mangoes. They stink. Their real name is Tommy Atkins. Don’t buy Scarlett mangoes. They stink. Their real name is Tommy Atkins. Ask your produce person to stock ONLY Ataulfos, Kents, Keitts or Hadens. p.s. 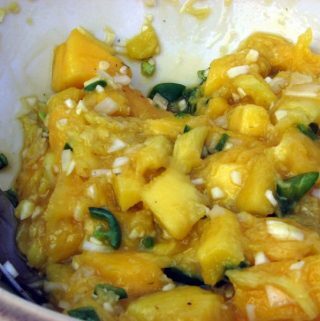 Stores in Florida and Hawaii have the benefit of locally sourced mangoes, so the acceptable varieties in those locales is a far longer list than the varieties listed above in item 3.
p.s.s. It’s also very likely true that other chains besides Safeway rely on the same tactics as I’ve described above. Safeway takes the heat today, but some other stores may soon be joining the Mango Hall of Shame. 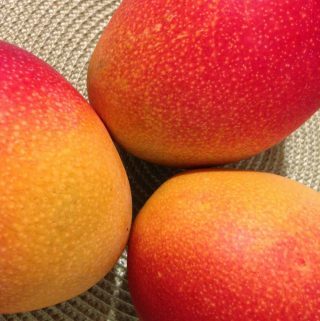 Previous Post: « Ataulfo Mangoes Arrive at Harry & David in June! Get ’em While You Can.